Former Dundee United and Clyde midfielder Karim Kerkar has rejected a move to St Johnstone. The First Division club thought they had secured the 30-year-old, who had been in the UAE with Al-Wahda. But manager Owen Coyle told his club website: "We had shaken hands on a deal to bring him to Saints. "But, unfortunately, after he had returned home to France and discussed it with his wife, he has told me that he has opted to remain there." French-born Kerkar, who has seven caps for Algeria, started his career with Gueugnon before spending three years with Le Havre. Following a short spell with Manchester City in 2002, he moved to Qatar club Al-Siliya. 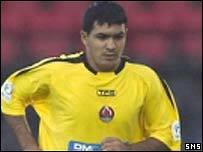 Kerkar spent a month with First Division outfit Clyde in 2004, won a short-term move to Dundee United but then headed to Dubai.